Right then, time for me to bid you farewell. For more reaction from the Stadium of Light, including what Louis van Gaal has got to say, head here. If you want a developing match report, you can find that here. "Today it wasn’t about them sitting back and holding. It was the opposition worked harder, chased harder, and decided to play in a much more offensive way. "In the end just that one moment of turning off for the second goal which was utterly unacceptable." Salman: 1 step forward, 2 steps back will define LVGs United. For every positive result, more poor ones follow. Time to cut our losses. Manchester United captain Wayne Rooney told BT Sport: "We did not create enough chances and were not aggressive enough. We did not win enough second balls and did not defend set-pieces properly, and it has cost us. "It will be difficult for us to make the top four now, we know that." "If they finish the season in 17th position Sam has done his job. "They are within striking distance and have a decent chance. The way they played today, just play like that, care that much about it and you absolutely have a chance." Sunderland boss Sam Allardyce told BT Sport: "Today was very similar to the way the Manchester City game went (which Sunderland lost 1-0) but this time we got what we deserved from the chances we created. "I thought we might be punished for not taking them and wondered whether it was going to go our way, but it ended up being an unbelievable win for us." A good point there by Pat Nevin about Allardyce's half-time team-talk. Not sure what Louis van Gaal said, but it clearly didn't work. "Sunderland what a story. I thought they were out at 1-1 they were second best in the first half but whatever Sam said at half-time it was the right thing. "Any thoughts of a draw were not in their head. They went for the win and in the end we could not argue with them." Man Utd, meanwhile, remain fifth. They will not be making up any ground on the teams above them this weekend, whatever happens when the top four play each other on Sunday. What a noise, and what a win for Sunderland... they are still in the relegation zone, but are up to 18th place, just a point behind north-east rivals Newcastle, who play Chelsea later. 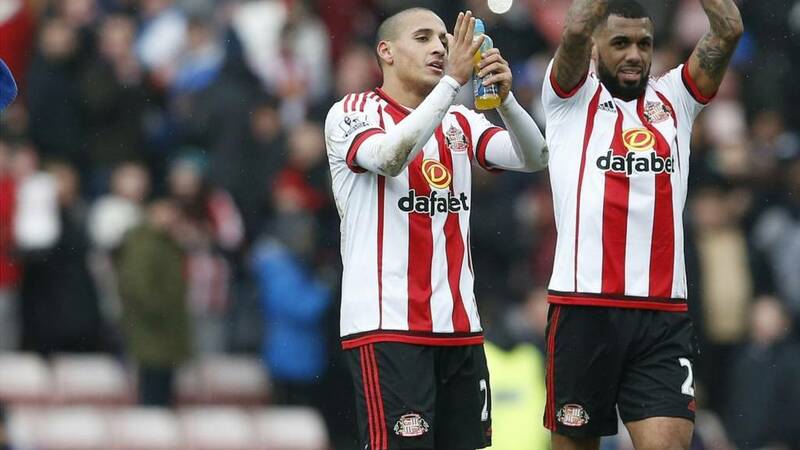 "What a noise the Sunderland fans have made and it has really helped the players." History has just been made. Sunderland have beaten United in the Premier League for the first time at the Stadium of Light. Patrick van Aanholt has been brilliant today and he goes on a solo mission for Sunderland here, breaking away down the left before firing into the side-netting. That would have sealed it. Sunderland are playing a bit of keep-ball over by the left-hand corner flag but United have it back and are hoisting the ball forward. 60 seconds left. A bit of respite for Sunderland as Chris Smalling pushes Dame N'Doye over by the half-way line. I can't see the Black Cats pushing too many men up for the free-kick. There will be four minutes of stoppage time at the Stadium of Light. Here is some late United pressure, though. Sunderland get a bit lucky when Memphis Depay's shot nicks off John O'Shea's waist and bounces wide. United wanted a penalty, but Andre Marriner says no. United are not exactly knocking on the door here, although Anthony Martial has had a shot pushed away by Vito Mannone. Ricky Lee Everett: No way LVG stays now after losing to this miserable Sunderland side. Kunal Gupta: Alarm bells. Issue is, they've been ringing since Christmas. For the sake of every United fan, someone please take action on LVG. Oliver Ranson: Massive win for Sunderland if they can hold the lead! "The marking was, I was going to say awful, but there wasn’t any to be awful. He is so far on his own after spinning away from his maker. He headed it down and there was nothing that De Gea could do."